For all of you in the stage of life that I am - today is a great day for you! We are going to be sharing Baby Shower Ideas. 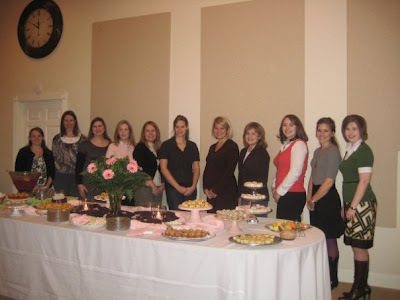 If you are like me - I throw/attend a lot of baby showers a year these days. I thought I would just show pictures from a few that I could find that we have done in the recent past. The first two pictures are a shower at my house for my best friend Laurie when she had her first daughter Emily. A tradition in our Sunday School class is to throw a big shower for the first baby and then meet at a restaurant for #2, #3, and on and just give gifts. I think that's a great way to do it. I threw this shower for a friend I worked with. My office came over and we had finger foods! We had a "Sweet Things" shower for my friend whose last name is "Sweet". It was all desserts! I made this diaper cake for that shower. It was my first attempt - not the greatest but kind of cute! 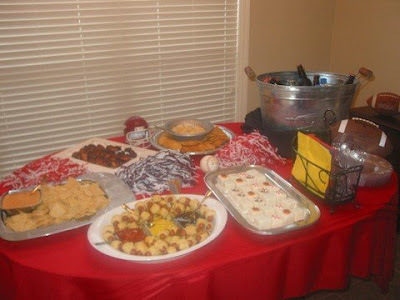 The table for the sports theme - we used balls and pom poms to decorate and served "sports" foods! This was another shower we had for a little boy. I think we did dips and sweets for this one! A girl in our class makes AMAZING cookies and she now has a full time career making cookies for everyone's parties. I've been to several more recently but these were ones I thought I would share. I'm anxious to see all of your ideas because we have a ton of showers coming up in my circle of friends! P.S. 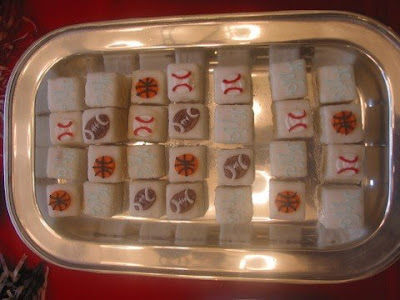 I don't know if Petit Fours are a "southern" thing or not - but some of you asked. They are just "little cakes". They are a mouthful of goodness! ha! Literally - it's just a bite sized cake. I love them because you don't have to deal with cutting a big cake and one or two petit fours are "just right" for most people. Plus you can decorate them in the cutest ways! BE SURE AND CHECK HERE TO KEEP UP WITH OUR SCHEDULE FOR UPCOMING FRIDAYS! Aw I love Ricks Bakery! I am from fayetteville, so I can appreciate a good Rick's cake. You threw such adorable showers, I love your tablescapes! You are the party planning queen!!! All the showers that you've thrown look wonderful. so many babies!! great ideas Kelly! love this week's theme! I love those cookies!!! Very cute. Those cookies look too cute to eat...I am sure I would get over it and eat several though. Those cookies are beautiful! I went to a shower recently that was a lot of fun. Instead of doing games, we did 2 crafts that were gifts for the new mom and baby! We stenciled onesies for the baby (it's a girl) and then we each made a scrapbook page with advice, encouragement, scripture, etc., and we got our pictures taken with the onesies we made. 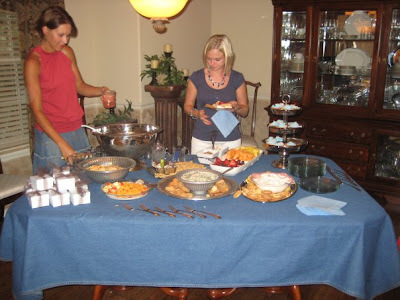 The hostess will get the pictures printed and will put them on our scrapbook pages. I thought this was such a neat idea! Super cute diaper cake. I love the big "E". you definatly have a niche to entertaining!! i especially love the cookies! i wish i was that patient!! Of course I love your table ideas...hence I started covering my stove are with fun fabric as well! Awesome idea and so versatile, just change it out for whatever occasion! Those cookies are adorable. She does an excellent job...very talented. I have 2 showers coming up and need some cute hostess gift ideas??? Any suggestions?? If I was your friend or in your SS class at church, I think I would try to have another baby just so you could possibly give me a shower with all the cute food that I am sure is delicious! Oh and I just read you other post, but with 300 comments wasn't sure if you would see this. So I will post on here, not because what I have to say is important or anything! HA! Gap and the children's place carry sleepers with the feet in them in the bigger sizes. I know gap may be more expensive, but you could get a couple to start out and alternate. TCP is relatively cheap, I think they run a special of 3 for $24? You could check those places for the footies. Also, I started using a blanket when Mollie Kate could get to her bottom by herself without me having to sit her on it. Have no idea if this info helps you or not, or maybe someone has already told you these things, I'm sure. Ok enough talking now!! Have a great evening! Kelly, you are an amazing hostess! Everything looks so good! I love the cookies, they are so incredibly cute!! This is some what unrelated, but I needed to tell you that I used your recipe for Cherry Limeade punch at a party I threw and it was so good! In LA we don't have Sonics, but I'm from the south so I regularly miss it, so this was great. Thanks for posting it on your recipe site!! What a blessing to be in one place long enough to celebrate with your friends! The food looks yummy, too! I like the idea of going to a restaurant for #2 and beyond. I remember seeing those cookies in some of your earlier pics...They are the cutest I have ever seen. Judging from the comments on the last post, you are probably at The Children's Place right now buying pj's. I forgot to tell you the thing I love most about their pj's is they zip all the way down instead of snapping or buttoning. So easy to dress them and change them but not easy for them to get out of because they have that piece of material that snaps over across the top of the zipper. Let us know what you find! oh p.s. if your friend wants to keep her information private she can email it to me: SKehrli@acosta.com. Thanks! Hi Kelly - what are petit fours? Are they something you make by yourself? Always get at a bakery? Is it a southern thing? I want to come to one of your showers! Or, I want you to throw one for me - ha! They all look so cute and fun! You should do a post on 2nd showers! I am pregnant with my 2nd child and some of my friends want to throw me a shower and I am not sure how they should go about it. Some people don't agree with 2nd showers and I would love to have some ideas. Can I just say that I LOVE the way you host?!?! And I love the way you decorate? You do a great table presentation for your parties! All that food looks yummy and is making me hungry! Those cookies are some kind of cute!! I'm sure your friends love and appreciate your willingness to host and plan their special parties for them! The pictures are beautiful! Love that green and white table cloth in the second picture! You are a great hostess! Wow, beautiful party pics. You sure know how to throw a shindig! I also wanted to let you know that your blog is the feature of the Daily Blog Review today. You can check out the review at my blog: All That and a Box of Rocks at http://www.lisaschaffer.blogspot.com. They all look great Kelly!! Love the sweets shower! What a cute idea! You MUST share who did those cookies!! I am sorta a cookie addict and would love to see more of her work!! 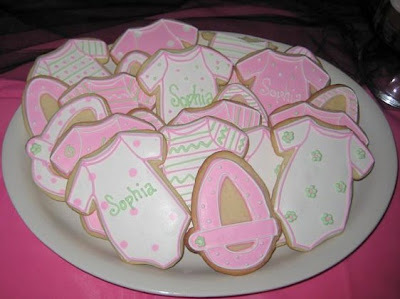 I just have to say those adorable decorated sweet cookies are fabulous. How unique! This was so fun to submit! 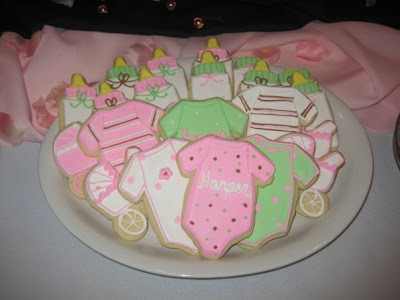 I do have 3 upcoming baby showers I will be personally planning and hosting, so this was great for me to get ideas! 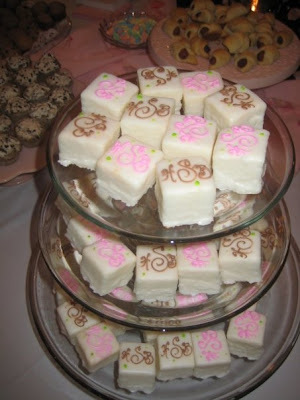 On another note, I LOVE petit fours and I do believe it is a southern tradition, though I could be wrong :) They are a hit among my friends and I.
I came by through another blogger and found this blog hop baby shower party that you are hosting! How fun! and what wonderful ideas! I usually do an ink drawing entirely composed of the little one's name and birth info, but will definitely use some of the great and cute ideas shown, to add with it. Thanks for sharing and hosting this meme. Love your posts and pictures! Do you mind sharing the contact info for the person who made those cookies? I'm doing a shower in September and would love to include some. If you'd prefer to send it privately, my email address is: lummus@comcast.net.